Like many, Jerrad Hardin had no time for God. He actually spent his time actively running away. “Had I … glimpse[d] over my shoulder, I would have noticed God running after me.” What a beautiful image that conjures up… God runs after us. What believers see as God instances, Jerrad Hardin dismissed as coincidences. There was no place for God in his life. “I had been running away from Him [God] for years.” Fortunately God does not give up so easily. 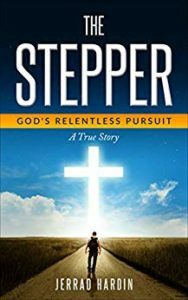 “Ever since I took my first step away from God, He followed me in a relentless pursuit.” Unable and unwilling to keep on running, the author issued God an ultimatum – to show Himself to be real – what happened next was truly amazing – and you must read the book to find out. The Stepper is a work of great beauty. Love shines from its pages. I am left feeling calm and peaceful. I urge you to pick up The Stepper today and let the peace of God invade your soul.